The secret is now out of the bag and we’ll see how Etsuko’s optimism will pull her through with this or if she will have enough time to sort-out her feelings when work comes knocking. 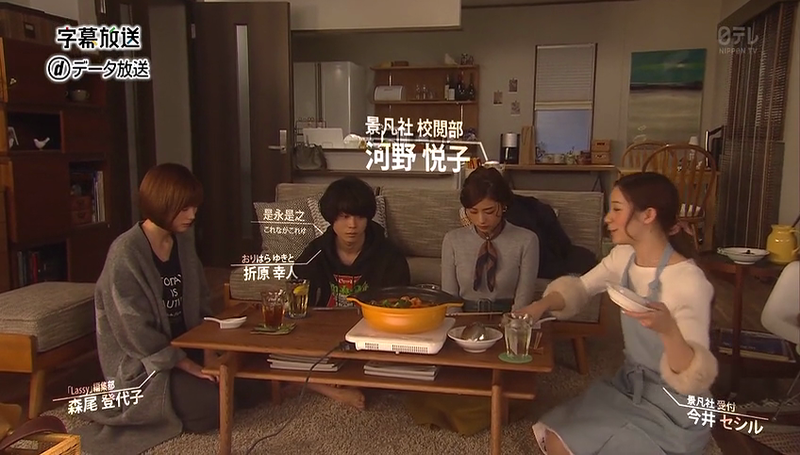 We continue from the last episode with Seshiru and Etsuko making a surprise visit at Morio’s home. Little did they know, they’ll be the one who gets a surprise when Morio comes in followed by Yukito looking like a couple who just did a grocery for dinner. Everyone is too surprise to say anything that Seshiru ends-up doing all the talking as she prepares the tomato and kimchi nabe for the dumbstruck party of three. Finally, Morio talks and said that she is just renting Orihara a room until he gets paid for being an exclusive model, she also adds that she already has a boyfriend so there’s nothing weird going-on. She even didn’t agree when Etsuko said that they are in cohabitation and said that their set-up is merely co-existing. Etsuko immediately switch back to her perky self and starts digging-in the nabe. She jokes that she didn’t know that Morio is such a big-hearted person for taking pity on Orihara and tells Orihara that he should do his best to get chosen as Lassy’s exclusive model so he can pay back Morio. Back at proofreading department, Takehara tells them that Keibonsha will be launching a new magazine with the goal of getting kids interested in reading. Keibonsha will novelized a manga or light novel for the said magazine, frankly, why would I be reading a novelized manga when reading the manga will be more engaging since it has pictures and so? Anyway, the goal for proofreading the monthly children’s magazine is to check whether the contents is appropriate for kids. Later on, Etsuko ran into Morio and to avoid an awkward situation, Etsuko praises her bag and asks where she bought it before eventually waving her goodbye. 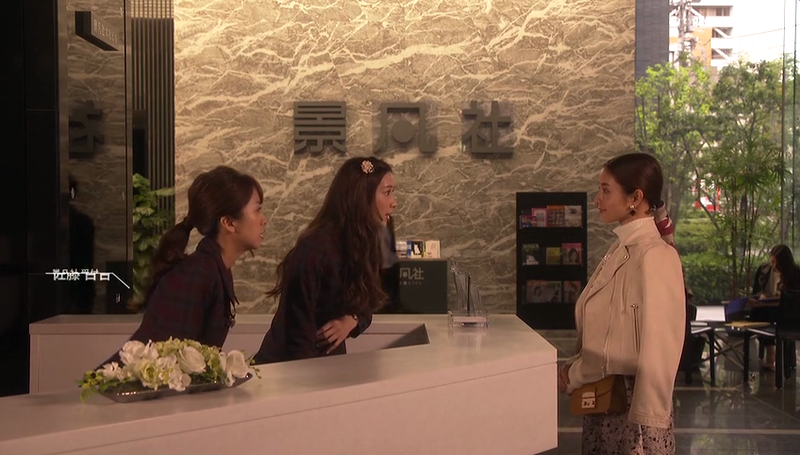 Seshiru and fellow receptionist sees their conversation and calls on Etsuko. They tell her that Morio and Orihara living together is really bad, a man and a woman living in one roof and nothing happens is totally impossible. Seshiru adds that Etsuko should at least be suspicious. Etsuko takes it into stride and leaves them saying that she forgot something. Etsuko goes straight to the washroom where she let out her pent-up frustrations by repeatedly telling herself that it’s really impossible, impossible that Morio rent Orihara a free room and there’s nothing. She let out a scream and coincidentally, someone in the men’s side is also letting-out a scream of frustration. 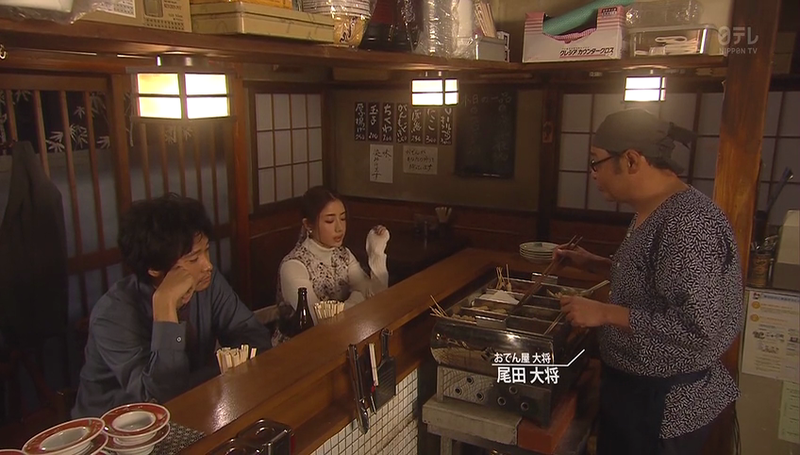 When Etsuko goes to check it out, she sees Kaizuka and the two ends-up at the oden place. The two laments on their own problems and while Kaizuka goes to the bathroom, Orihara arrives, awkward. 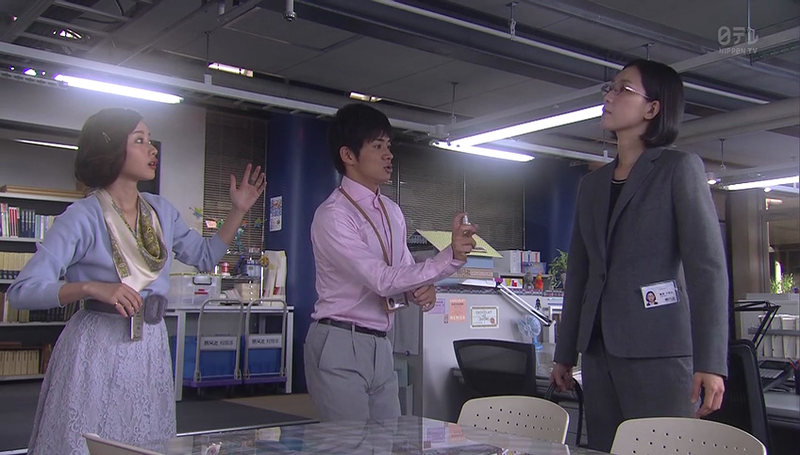 Well their awkward situation is saved by Kaizuka who has a lengthy tirade on Orihara for ignoring his calls. 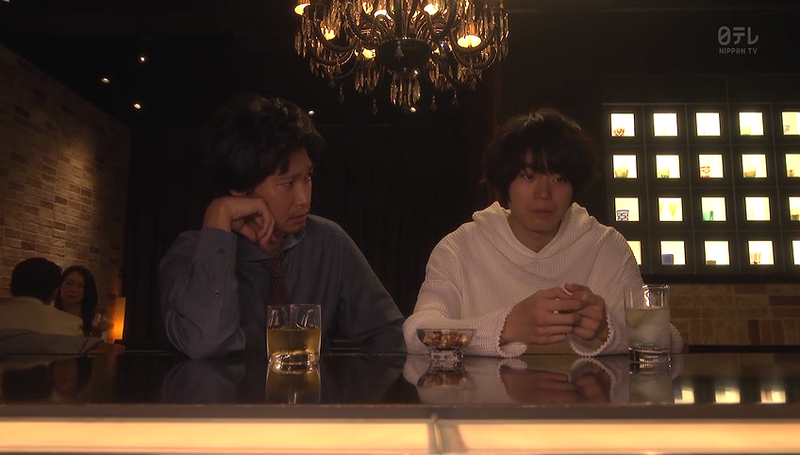 The two go to some posh bar and Orihara apologizes for ignoring his calls, Kaizuka tells him that he’s being troublesome as if he’s still 15 and Orihara says that the time when he was 15 was definitely better. We see a flashback to the source of Kaizuka’s present dilemma and that’s because his boss doesn’t want to publish anything anymore by Korenaga Koriyuki, for him he’s a one-hit wonder, but Kaizuka insists that Korenaga has the potential. Then his boss asks if he thinks that Korenaga’s latest novel is interesting, you know the dog-ish title with linear motor cow. For that, Kaizuka can’t give his boss a direct answer. 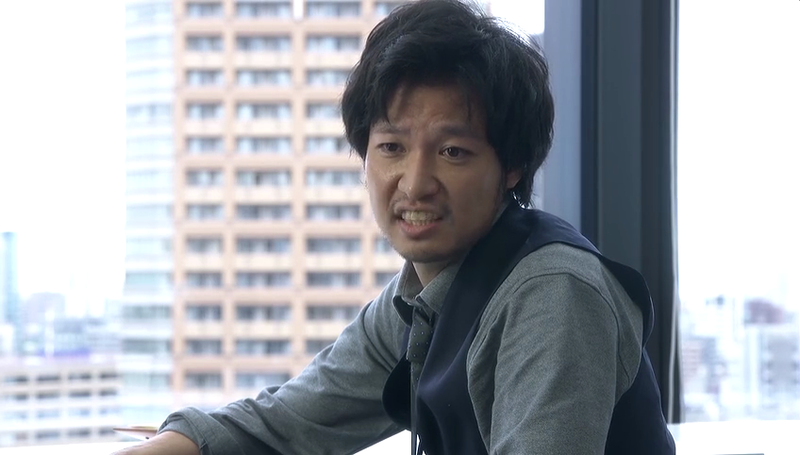 Back at present, he asks Orihara if he has placed a new work or if he’s still in slump. Orihara tells him that he’s been thinking lately if he’s really suited to be a writer. At work, Etsuko is having a hard time proofreading Saionji-sensei’s work for the monthly children’s magazine. Saionji-sensei will be the main writer for the magazine and as Etsuko reads her story, she thinks that her words will be too hard for kids to understand like they’ll be needing a dictionary to check each kanjis. Fujiwa says that if kids read complex words and expressions then they’ll be able to learn something unlike with easy words. 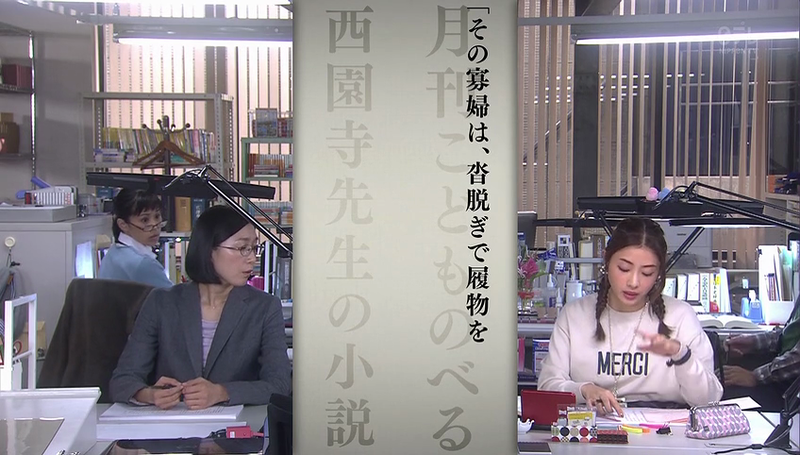 However, Etsuko says that if kids will be reading books with complex words and expressions then they might lose interest in reading and Fujiwa counters that if kids lose interest, then that book is not for them. Geez, Fujiwa, this is why kids prefer manga. So Etsuko decides to bring her complaints to Kaizuka to check if Saionji-sensei really knew that her latest work is geared toward kids. 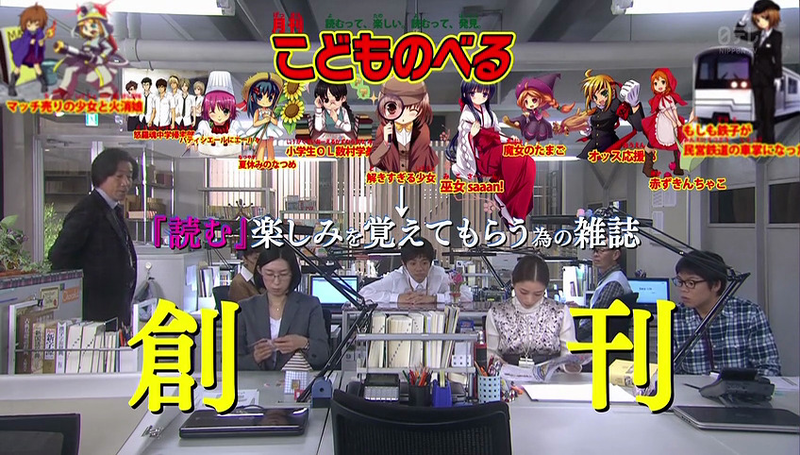 After she’s gone, almost every staff of proofreading department goes out to do their own fact check leaving Fujiwa alone in the office, haha. Fujiwa complains to Takehara that everyone goes out of their desk since Etsuko arrives and Takehara just says that the place became livelier since Etsuko arrive. I really want Takehara as a boss. 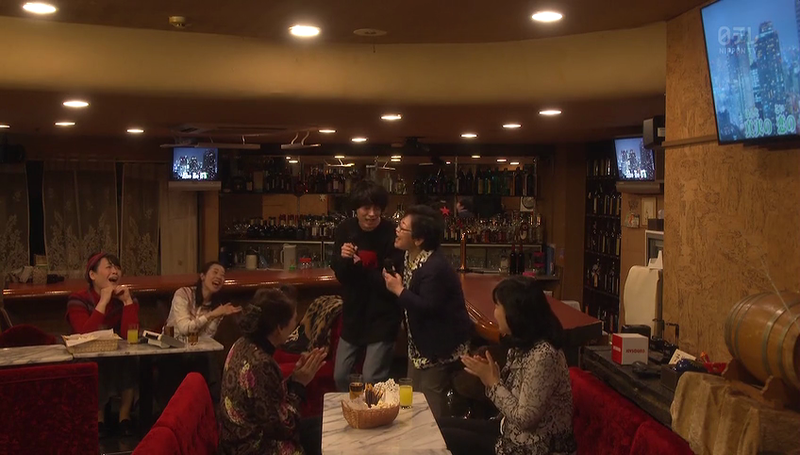 Unfortunately for Etsuko, Kaizuka is not around and then she sees Orihara helping a kid at Keibonsha’s lounge. Afterwards, her interest in Orihara have piqued so she decided to follow him throughout the day. Well, he proves to be quite an eccentric as he goes from one place to another doing anything, from playing gate ball, singing karaoke with older ladies and Etsuko has to mentioned that he sang a medley of Ishihara Yujiro’s songs, and playing arm wrestling with kids. 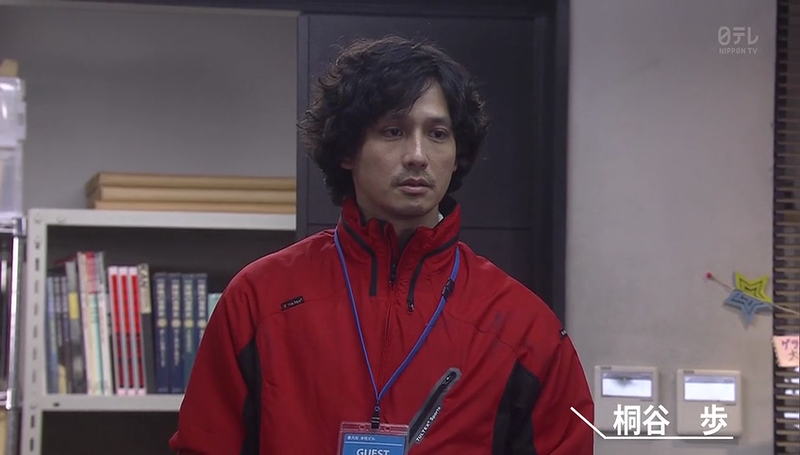 Etsuko feels tired from following him that she deduces that she really can’t understand him and Kaizuka agrees. Turns out, Kaizuka is just beside her. So the two goes back to Proofreading department and Etsuko tells him all about Orihara’s day and it irks Kaizuka that Orihara is doing those things when he should be writing. Anyway, Etsuko remembers the main reason she was looking for Kaizuka and asks if Saionji-sensei really wrote the book knowing that it was for kids. Kaizuka agrees and tells her that he even explained in person what needs to be written. Etsuko tells him that Saionji-sensei is probably not into the magazine at all and asks Kaizuka if it’s possible not to include Saionji’s work since they need a writer who is more dedicated with the project. Kaizuka says that it’ll be impossible because Saionji is the cream of the crop and her name alone will sell the magazine. So Etsuko asks if he doesn’t care about anything else as long as they sell, and someone arrives to agree to Etsuko’s statement. Enter Kiritani-san, currently a deliveryman and formerly an aspiring writer who seem to have a bit of grudge to Kaizuka, or so I thought. Kaizuka pays Kiritani a visit and begs him to let him read his work. Compared to Orihara/Korenaga, Kiritani still writes even though he doesn’t send his manuscripts to anyone because he still felt bad getting rejected and wasting all those efforts. In her room, Etsuko continues to proofread Saionji’s work and grows tired and irritated every minute. Orihara calls her and when he asks if she’s busy, she said that she brought home Saionji’s draft that she missed doing during lunch. Feeling bad for secretly following Orihara, she confessed that she did follow him to see how he spend his day because she realized that she doesn’t know anything about Orihara. She pretended that she totally understands his and Morio’s situation even though she didn’t; yet she felt absolute low for following him around. Orihara didn’t say anything about it and just asks Etsuko if they could meet tomorrow and Etsuko agrees. At Morio’s home, she excitedly tells Orihara that tomorrow is the day that Lassy’s exclusive model will be chosen. Morio tells Orihara if they should celebrate in advance since she feels like things are going in the right direction and Orihara comments that Morio seem happy about her work unlike before. The next day, Takehara apologizes to Etsuko for making her proofread Saionji’s work when she pulled out in the end. Etsuko doesn’t mind since she has been thinking that Saionji isn’t that dedicated with the children’s magazine anyway and that it’s not good to release someone else’s work when you’re not fully dedicated to it. Kaizuka tells her that no one is fully convinced with their work, and Etsuko is an example since she doesn’t really want to be a proofreader. However, Etsuko points out that she’s a different case and that she sees her present work as something that will be of value when she becomes Lassy’s editor. As an example, she just proofread a book on snakes and she learned about different snakes in Japan. She thinks it will be handy once she becomes an editor when she’s asked to look for snake skin printed bag, she will be able to propose different types of snake skin bags based from what she learned. Also, she also proofread a book about Edo period and learned the different fabrics used for kimono, which she think will be useful once she becomes a fashion editor. Etsuko is a good example of the saying, “if you can’t change your situation, change the way you think”. Kaizuka looks impressed by Etsuko’s mind and tells her that unlike Etsuko who looks forward to everything, he isn’t like that who is still stuck in the past. Speaking of past, Kaizuka receives a package and was surprised to see that it contains manuscripts from Kiritani. He reads them one by one until he sees a manuscript that Kiritani is intending to give to his nephew but he didn’t since kids doesn’t like to read nowadays. Kaizuka reads it and got so impressed, he practically forced his boss to print it for the monthly children’s magazine as a replacement for Saionji’s work. 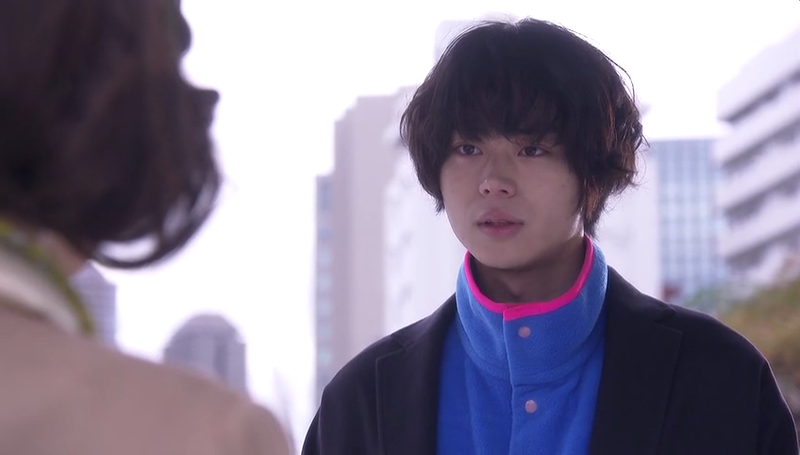 At the Koetsu department, Yoneoka shares his perfume to Etsuko and she teases him about his date. Yoneoka will be watching a wrestling match with Masamune (who I just learned works for the printing department) while Etsuko will be meeting Orihara. Fujiwa calls on them and the two thought that they’ll be lectured for using perfume. Then, Fujiwa asks if Yoneoka can spray his perfume on hers too and Etsuko tease her about her date. Fujiwa surprises everyone by saying that she’ll be going on a date with her husband since they are celebrating their 10th year anniversary. Woot! Everyone is gobsmacked and even Takehara doesn’t know about it. 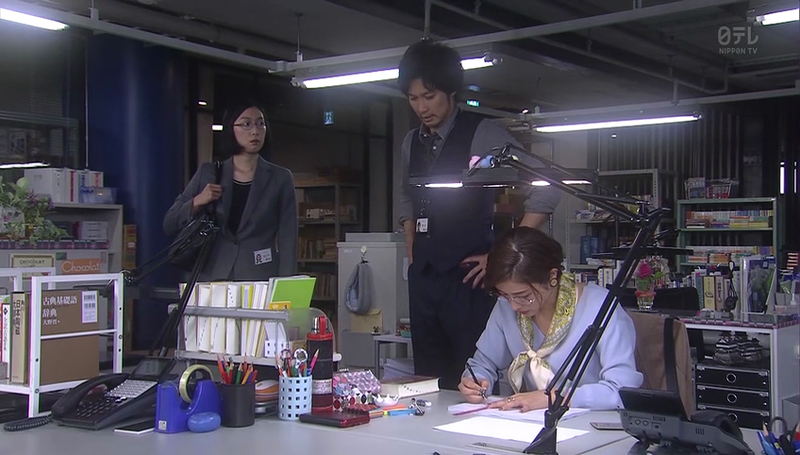 Anyway, Etsuko was about to leave but Kaizuka stops her to proofread Kiritani’s work since it has to go to the printing by morning the next day. 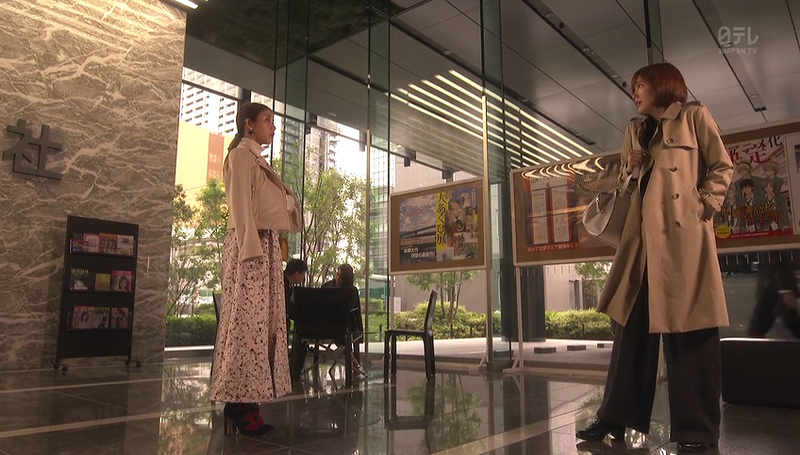 Of course, he has to bow to Etsuko since he’s asking a really huge favor. Etsuko can’t say no, and soon enough, she’s back in the office to do the first revision. 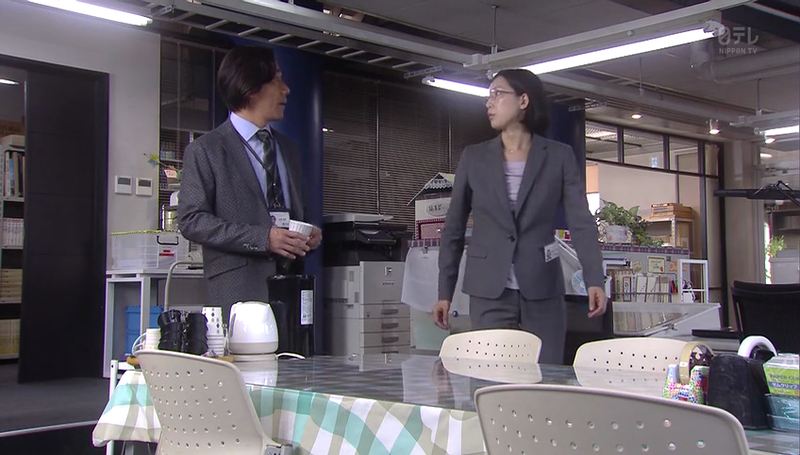 Fujiwa arrives since she forgot her husband’s gift and sees Etsuko working on a draft. 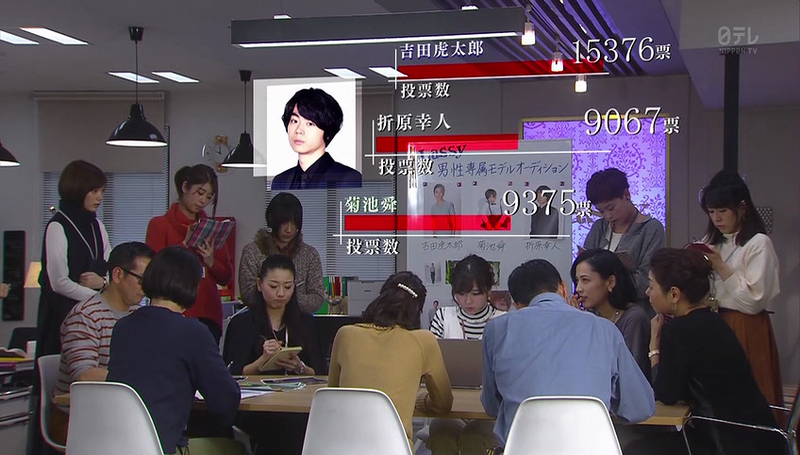 Fujiwa lectures Kaizuka that the story Etsuko is working on usually takes 3 days to finish and with the pace that he needs for it to finish will make the proofreader prone to committing mistakes. As what Kaizuka told his boss earlier, he also tells Fujiwa that he’ll take full responsibility. Fujiwa still finds his demand unreasonable but she calls her husband to say that she’ll be working overnight because of last minute work. She instructs Kaizuka to give her the specifications for the galley proof since she’ll be editing that once Etsuko is done with the first revision. Also, Kiritani has to be present so he can check the revisions. As for second revision, they call on Yoneoka to do that. Yoneoka arrives with Masamune, both wearing the wrestling t-shirt, to help the guys with proofreading. Masamune also does his share by checking the facts that needs to be check. Kiritani is present and he’s impressed with how much work the proofreaders put in a single writing. Orihara also arrives to give them some refreshments and also helps Etsuko with some things. Speaking of Orihara, he got chosen as Lassy’s exclusive male model and he wins by a measly one point to the strongest contender. Morio is happy and she goes home to celebrate, only to find her flat empty. Her faceless boyfriend calls and Morio tells him that she dislikes forcing herself anymore and asks if they can separate ways. I think the faceless boyfriend agreed and afterwards, Morio calls Orihara only to have her call directed to the voicemail. Anyway, the 6am deadline is almost within their reach but Kaizuka asks Kiritani about one dialogue in his book where he thinks that Kiritani has more to add (probably to give the dialogue a boost). Kiritani says that he does and re-write that portion while the proofreader’s completes the revisions. Finally, Fujiwa, Etsuko, and Yoneoka beats the deadline and gives the galley proof to Masamune to send it to the printing office. Kaizuka thanks everyone for the huge help and Kiritani also thanks everyone for doing that much for his low-level novel. Etsuko tells him that his work is really fun based from what she read. 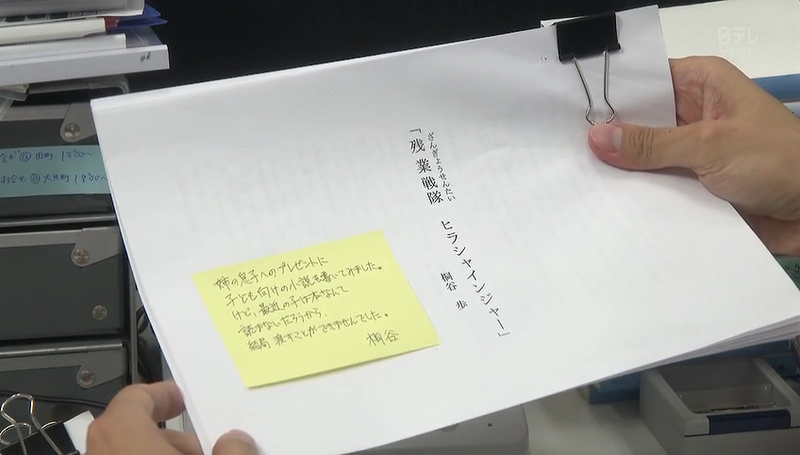 Also, the last-minute addition and re-writing that Kiritani did at Kaizuka’s request just increased the book’s level. So it is low level? Hah. Witnessing that touching moment between an editor and the writer, Orihara tells Kaizuka that he doesn’t know where his switch is. He tried to do different things and meet different people but he still doesn’t see it. He has been struggling so much and still can’t write and thinks that he can’t write anymore so he asks Kaizuka to just give up on him. Kaizuka gets emotional from what Orihara told him and tells him that he should have told Kaizuka sooner since an editor and writer should work together, worry together, that he should rely on Kaizuka more, and gives Orihara a tight hug until Orihara has to tell him to let go, haha. Later on, Orihara walks Etsuko home and he tells her that he likes her, he really likes her. Aside from the last moment, this episode has been pretty uneventful. 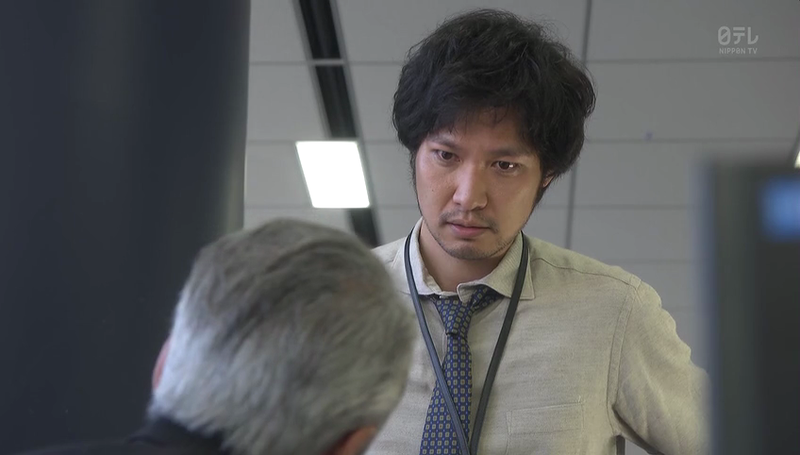 I guess I was expecting too much when Etsuko sees Morio and Orihara together but since Etsuko is in denial, she chose not to confront it and thankfully, she has a job to make her busy. This episode is pretty much about work with Etsuko pulling an all-nighter and still looks like a human is unfair. 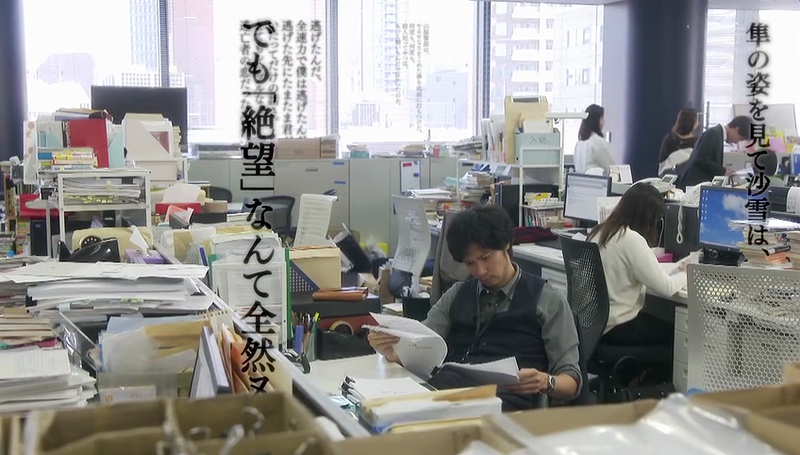 But I really like the working relationship of the proofreading department, aside from Fujiwa, everyone is so laidback but you also know that they take their job seriously and delivers well. I think one of Etsuko’s qualities that I like is that she really puts on more than 100% effort in her work even though it wasn’t her first choice. Also, I hope her optimism will infect me because it just makes everything looks better. As for Morio, I really think that she’s starting to have feelings for Orihara but she’s in a bind since she knows that Orihara likes Etsuko and vice versa. However, the only upper hand she has is that she’s living together with Orihara. As for Orihara aka Korenaga Koriyuki, I felt bad about the writer’s slump that he’s been having. That must be frustrating, not being able to write, and even if he writes something, even he isn’t so convince that he has written something good. BTW, I thought Orihara is still a college senior so how come I don’t see him going to school or even looking for jobs based from what he majored in college. He really has lots of free time. All in all, now that Orihara have finally confessed his feelings for Etsuko, we’ll see if Etsuko will confessed back and they live happily ever after. 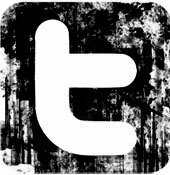 Posted on November 27, 2016 November 27, 2016 by mikuchinPosted in Fall 2016, Recaps | ReviewTagged Ishihara Satomi, Jimi ni Sugoi, Munetaka Aoki, recaps, review, Suda Masaki, Tsubasa Honda. 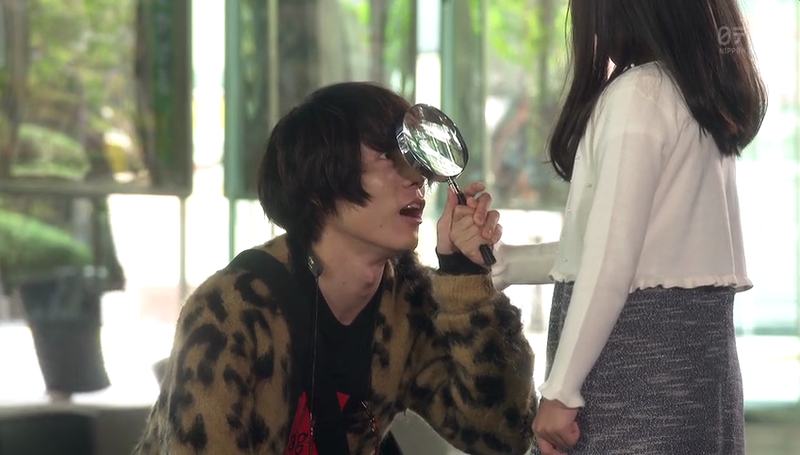 Thank you for recapping this drama, I watched it but subs are quite slow (but Im still grateful) so reading your recaps is really helpful. Welcome…hoping to put up episode 7 tonight!